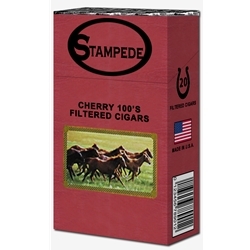 Stampede Cherry Filtered Cigars are available in Box 100's and packaged 20 cigars per pack, 10 packs to a carton for a total of 200 premium filtered cigars. Enjoy your smoke with some of our best Stampede Filtered Cigars. If you are in a hurry or on the go, these are the cigars for you. Whether you are looking for that extra flavor, or just want to keep some of the unneeded tastes out of your cigar, our collection of Stampede’s Online are more than perfect for your night out on the town.